Hacienda Belvedere was a 1,700 cuerdas or 1,649 acre plantation on the Western coast of Puerto Rico overlooking the Caribbean Sea in Barrio Miradero between what is today known as Puerto Real and Joyuda. It was the second largest plantation in the region after Hacienda La Monserrate which was the largest sugar plantation in the area located South of Boquerón Bay. La Monserrate, named after Our Lady of Montserrat, the Patron Saint of Catalonia, was established in the 19th century by prominent Puerto Rican autonomist and physician of Catalonian descent Dr. Salvador Carbonell (1841-1907), who spent time in the El Morro jails in the late 1880's for his opposition to the then prevailing Spanish regime. According to José Ferreras Pagán in his 1902 book Biografía de las Riquezas de Puerto Rico , the origin of La Monserrate differs from our description on the PR Trapiches page. In his book, Ferreras Pagán also states that "Vervedere (sic) was established by the Cabassa Brothers who installed its machinery consisting of a 2x6 boiler, 2 clarifiers, 3 evaporators, simple battey, 2 pumps, 3 filters for cachasa, 1 Egroot still, 1 grinding mill and its machinery". It reportedly operated until ca. 1905 reopening ca. 1916 with updated equipment installed by the Fundicion Simon Carlo in Mayaguez. In 1924 it was dismantled and its machinery sold in the Dominican Republic. Other sources obtained state that Belvedere was established in the early 19th century by the Monagas family. However, there is no conflicting information regarding its owner in 1902 as the estate of Joaquin Vidal Jiménez (1840-1900) consisting of Joaquin (1866-1898), Juan (1873-1917) and Ignacio (1863-1938) Vidal Beiso. Ferreras Pagán states that in 1902 its administrator were the Vidal Brothers. It was later owned by the Alemañy family. 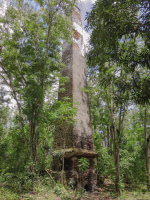 The hacienda had a small sugar mill or "trapiche" with the still standing chimney pictured below and a large stone house with 'ausubo' ceiling which has been demolished. 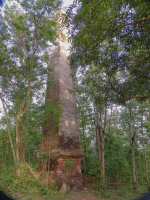 It is about 4 miles NW of the town of Cabo Rojo where its owner Julio Monagas had a large, late 19th century, masonry house on Betances Street, near City Hall. There was also another hacienda in Cabo Rojo, the Hacienda Borinquen, where today is the Urbanización Borinquen, not far from the old cemetery. It was owned by Mateo Fajardo Cardona and his wife Antonia Cabassa, the owners of Eureka Sugar Mill . There are no remains left of the Hacienda Borinquen or Hacienda La Monserrate.